Dana Connors, president of the Maine State Chamber of Commerce, speaks in opposition to Question 2 on the November ballot, which seeks to raise $157 million in funding for Maine schools by taxing Mainers who earn more than $200,000 per year, during a news conference in Brewer on Thursday. BREWER, Maine — Calling it the wrong solution to a real problem, a group of business leaders and former education officials came out Thursday in opposition to a ballot initiative aimed at raising money for underfunded schools through a new tax on high-wage earners. Question 2 on the November ballot, championed by Stand Up for Students, a coalition led by the Maine Education Association and the Maine People’s Alliance, seeks to raise more than $157 million toward education by adding a 3 percent tax on taxable income above $200,000. “While we firmly believe all of Maine’s public schools need to be adequately funded, the tax increase proposed in Question 2 would be detrimental to Maine’s economy, and especially our small and family-owned businesses,” said Dana Connors, president of the Maine State Chamber of Commerce, during a news conference Thursday in Brewer. Back in 2004, Mainers passed a referendum requiring the state to fund 55 percent of “Essential Programs and Services,” the state’s estimate for minimum school funding by district. The state has never reached that threshold. This year, it’s funding about 47 percent of the costs. The state also is required to fund 100 percent of special education costs, but this year is only funding 35 percent, said John Kosinski, campaign manager for Stand up for Students. The new tax would direct more money to schools, and help the state finally meet its funding requirements, proponents argue. Also on Thursday, the Maine Small Business Coalition broke ranks with the state chamber by announcing its support of Question 2. Opponents of the measure, who held news conferences on Thursday in Portland and Brewer, argue that a new tax would make the state less attractive for investment and make business more difficult for small business owners. 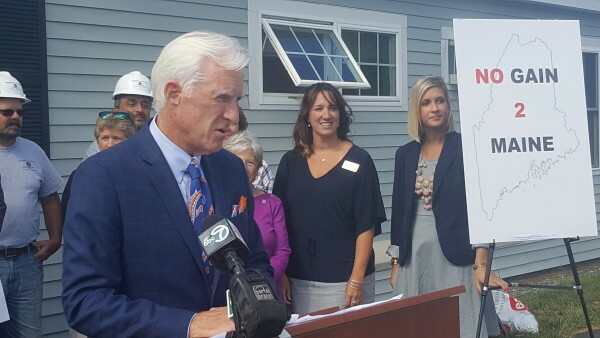 Kosinski said the new tax on incomes over $200,000 would affect just 4 percent of Maine’s small business owners, while helping schools provide quality education. Jim Rier, Maine’s former education commissioner, also spoke in opposition to Question 2, calling it “flawed on many levels.” He and other opponents of the proposal question whether the money raised by the new tax would make it to students who need it most. “If it passed, towns like Cape Elizabeth and Falmouth would get millions, while rural areas would see no benefit at all and would, in fact, find it even more challenging to recruit teachers to their districts,” Rier argued. The additional funding would be cycled through the state’s education funding formula, a complex equation that determines how much each school district receives from the state to help it cover the costs of education. Rier argued that pumping more money into that equation would result in some rural schools getting little if any help, while larger districts with more students could see a more significant boost. Many of those more wealthy districts should have more ability to turn to local taxpayers to fund education, an option more rural areas don’t have, he said. Kosinski argued that all Maine school districts are underfunded, and that Question 2’s passage would help most Maine students, while holding the state to its education funding promise. “The state is falling down on its obligations to these schools,” he said.